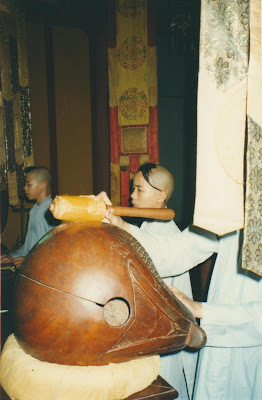 My obsession with monks is quite widely known, and indeed it is not uncommon in the Buddhist world. Some people collect them like pop stars, having pin-ups of their favourites and waiting in line to be blessed by them and have their picture taken. 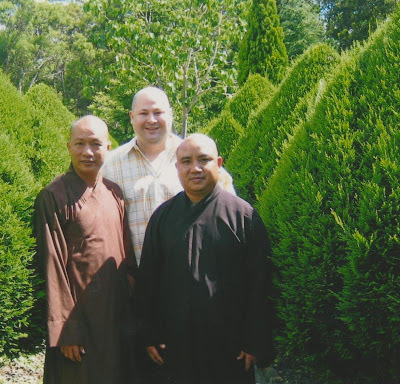 A couple of years ago two of my greatest friends from Vietnam came for a surprise visit to Sydney, and I was able to take them on a couple of tours through Buddhist Sydney. This is us in the garden of Wat Pa Buddharangsee, the Thai Monastery in Leumeah, outside Sydney. 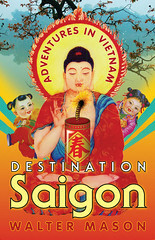 Both of these monks feature in stories in Destination Saigon - can you guess? This is a group of Theravadin monks taken at a big Theravadin forest monastery in Dong Nai, sometime late in 1999 I would imagine. 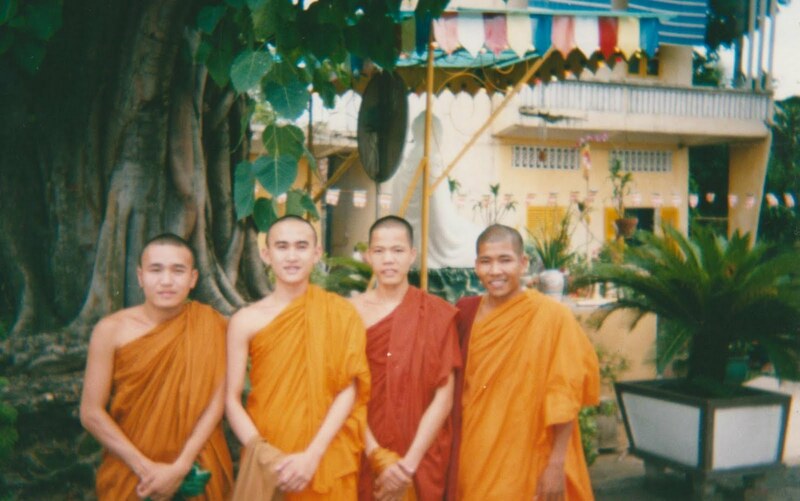 It was when I was studying in Vietnam, and I was hanging out with Theravadins a lot. A group of novice monks doing their afternoon chanting at a monastery in Hue, 1996. This is a simply beautiful monk belonging to the Tang Gia Khat Si, the indigenous Buddhist order of Vietnam. We have been friends since 1996, and we are the same age. 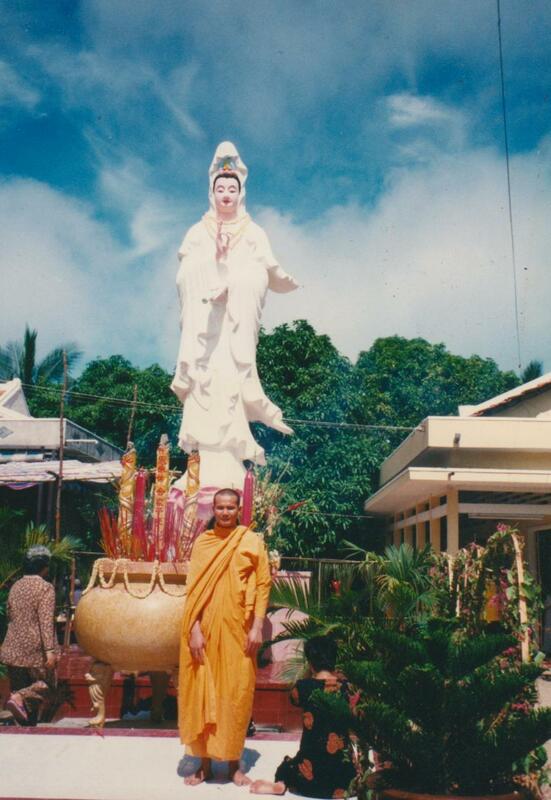 This is a pic he sent me as a souvenir (once a common practice in Vietnam). He signed the back of the photograph but didn't date it. I am guessing some point in the late 1990s. 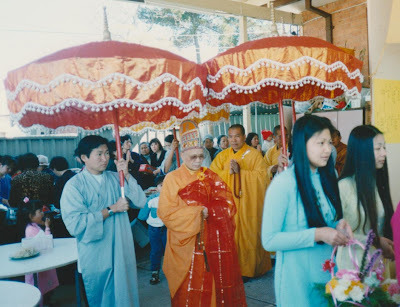 In Sydney again, this is a religious procession in the backyard of Chua Phuoc Hau, a suburban house temple in Cabramatta, right near where I now live. Pictured in the photograph are the Most Venerable Thich Phuoc Hue and the Most Venerable Thich Quang Ba.